Welcome to Paradise: A Requiem looked at how the terror attacks of September 11, 2001 have influenced events in the post 9/11 world. Questioning the infringements on civil liberties and human rights that have been enacted in the name of democracy and freedom, it asked whether words, laws and actions have become so disassociated from one another that they have lost their relative meaning. Set in Kanonhallen, a former munitions storage in the north of Oslo, this interactive performance mixed original music, movement, and text with shortwave radios, military shells, enormous glass sculptures, interactive electronics and audience activities, probing issues of violence, abuse, and torture from multi-faceted perspectives. Previously classified documents, testimonies from terrorists, and lounge music mingled. Using the double speak of political Orwellian absurdities, Welcome to Paradise: A Requiem dissected the propaganda of both individual and state-sponsored terrorism. 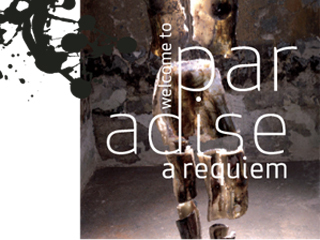 Welcome to Paradise: A Requiem was a collaborative interdisciplinary work between a group of musicians, actors, dancers and a visual artist, all from different countries and backgrounds, that I initiated in response to my distress at the turn of events after Sep 11, 2001. It premiered Sep 11, 2008. The main question for me behind this work was “why and how can people be confronted with serious human rights abuses, and yet choose not to respond?” In collaboration with my colleagues, we tackled this question by exploring issues of groupthink and propaganda. The performance was created over a period of a year during various workshops, rehearsal periods, and long distance communication. Much reading went into the research on the phenomena of groupthink. Primary sources were Philip Zimbardo’s “The Lucifer Effect”, Canetti’s “Masse und Macht”, works by journalists and lawyers working with the issues at Guantanamo, and numerous government memos dealing with interrogation and treatment of enemy suspects. Much of the structure of the work and most of the music was collectively created; some portions were created by individual members of the group. The public was informed that they could arrive and leave as they wished. With very few exceptions, most came at the start time. No one left before the end. The public was also informed they could move about the space freely. For the most part, people moved as they were directed to move by our “guard – guides”. Only a few individuals chose to move or place themselves apart from the crowd. The public was given the choice to arrive on their own to the performance space (Kanonhallen, a former ammunitions factory built by Russian prisoners in WWII) or to board a bus at City Hall in Oslo that would drive them there. We chose the City Hall since it is best known for being the location where the Nobel Peace Prizes are awarded. On entry to Kanonhallen, the public was presented with a choice – to self-select as “poor” or “rich” – and to pay a ticket price accordingly. Those who stood in the “poor” line paid ¼ of that which those who stood in the “rich” line paid. Very few people, however, self-identified as poor. Other questions throughout the evening continued to create various separations of the public into different groups – by gender identification, by height, by choice of movement left or right, by choice of which candies they preferred, etc. The performance was already in process as the public arrived. The public entered a foyer where they had to go through an absurd security check. A TV monitor was playing the CSPAN coverage of the testimony of the Canadian citizen Maher Arrar to the US Congress about his unlawful rendition to Syria and subsequent year-long imprisonment and torture. Music was audible in the distance from the hall. On the other end of the hall, multiple panels of glass were hung. Some of these had images projected on them, and/or writing. Behind the panels the audience could observe Æsa Thorsteinsdottir (the glass artist) in a white lab coat in the process of making plaster molds of bodies in a kneeling position. She continued this process throughout the performance, making a series of casts one by one. Those of us who were ‘cast’ (different members of the ensemble each night) had to remain in this kneeling stress position for 20 minutes while the plaster-soaked material hardened to a shell. The audience was guided throughout the evening through a series of tasks, herded to different areas of the space, feted with champagne, candies and chocolate pudding, offered a wine lottery, treated to a mock tribunal and a pop quiz, and in general presented with many types of distractions that contrasted to the visual and audio environment, and to some of the movement material that was being performed. The activities were designed to give audience members a concrete and palpable experience of how much being part of a group exerts a pressure to conformity, even in absurd situations. The choices of activities were worked out by the ensemble in response to the principles of how group pressure works, outlined by Zimbardo, Lifton, Milgram and other researchers.